Although online poker isn't specifically addressed, we would conclude that, no, online gambling is not legal in Idaho. (2) No activities permitted by subsection (1) shall employ any form of casino gambling including, but not limited to, blackjack, craps, roulette, poker, baccarat, keno and slot machines, or employ any electronic or electromechanical imitation or simulation of any form of casino gambling. Point number one, poker is considered a game of chance, which is gambling and therefore illegal. Point number two, poker is specifically mentioned as a form of casino gambling. So I think it's safe to assume you can't play poker legally online. Idaho doesn't have laws specifically pertaining to social gaming or home games. So unlike other states where home games are ok so long as you take no rake or house fee, it appears that home games would fall under gambling, thus making it illegal in Idaho. However, Idaho has relaxed their laws some. There was a bust back in early 2010 where a senior center poker game was raided. The law at the time was that prosecutors were charged with a misdemeanor if they failed to act on investigating or prosecuting a gambling allegation. Still, the community was outraged which prompted a measure to place discretion in the hands of investigators. So now they get to choose (to an extent) what gambling related allegations they pursue. So I would deem home poker games in Idaho as hit or miss. It's definitely more illegal than not, but you might be ok if you keep the game quiet and play for nominal amounts of money. Do Casinos in Idaho Offer Poker? There are casinos in Idaho that offer video poker, virtual blackjack, bingo and slot machines. However, you won't find legit table games or poker. We receive a lot of questions about state poker laws and what residents of Idaho are allowed to do. We thought it'd be helpful to post those here. 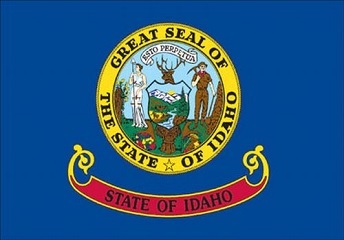 Will online poker be regulated in Idaho? I wouldn't hold your breath. In January of 2012, Jeff Anderson, the state lottery director, told the Idaho reporter that "there are no plans to even suggest looking into the issue in the Gem State." Is there an online poker room that accepts players from Idaho? Most American poker sites prohibit players from states with stricter gambling laws from even signing up to their rooms -- even for play money! However, that's not the case in Idaho. It's still possible to play online poker, at your own risk, of course. You can sign up to sites like Americas Cardroom, BetOnline, Bovada and Sportsbetting Poker. What other forms of regulated gambling is offered in Idaho? Residents of Idaho can partake in horse racing. If you go to one of their Indian casinos you can also play video poker, video blackjack, bingo and slot machines. Idaho also has off-track betting and a state lottery. Where can I read more about Idaho poker laws? Here are some interesting facts about gambling and poker in Idaho state. Idaho residents are only allowed to have "antique" slot machines. For a slot machine to be considered antique it must've been built before 1950 and have no electrical components. It must also be used as a decorative piece -- you're not supposed to use it under any other circumstance. (2) The provisions of section 18-3804, Idaho Code, shall not apply to antique slot machines. For the purpose of this section, an antique slot machine is a slot machine manufactured prior to 1950, the operation of which is exclusively mechanical in nature and is not aided in whole or in part by any electronic means. (4) An antique slot machine may not be operated for any purpose. Idaho residents under the age of 18 cannot play in a bingo game if that game has a prize of more than $50, or in a bingo game licensed by a charitable organization. An Idaho collector has a vintage poker chip collection valued at more than $30,000.